Are you looking for a top private university in Bangladesh in order to complete your Bachelor of Business Administration (BBA) degree? If so, then you’re at the right place as we’re with enough information regarding this issue. Currently, one of the popular choices for graduation is the BBA degree, which is conferred after four years of full-time study in one or more areas of business concentrations. In this course, it comes with general business courses and advanced courses for specific concentrations. And if we talk about private universities in Bangladesh then the journey was started after the formation of the Private University Act 1992. And currently, there are more than 80 private universities across the country and another 12 has been approved by the University Grant Commission (UGC) who is going to start their curriculum very soon. 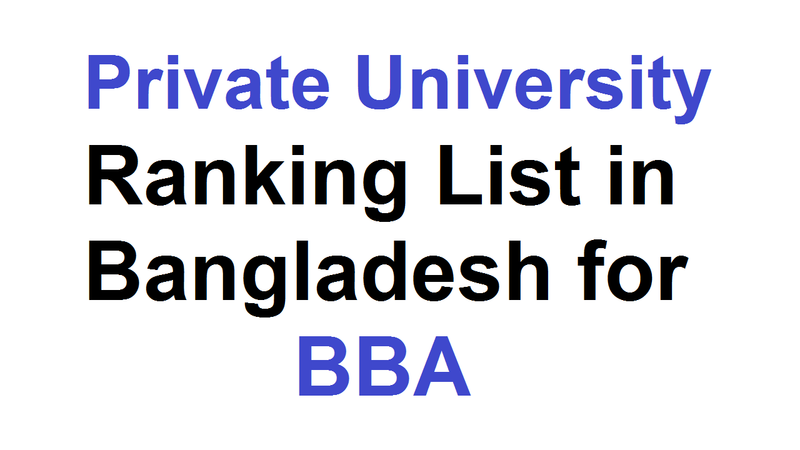 Why Study BBA in Private University in Bangladesh? There are many reasons to choose a private university in Bangladesh and the first and foremost one is that there are some universities where you can get the world-class education at an affordable cost. There are many options for those who complete the BBA degrees in various industries. From Operations manager to Information security officer, they can work for Sales manager, Loss prevention manager and many more similar posts. The private university in Bangladesh offers the BBA degree, which is in commerce and business administration where students can gain knowledge of business practices and processes, understand the role of economics in the world marketplace, and acquire an awareness of global business issues through BBA courses. Now, let’s see the specializations of BBA in private universities in Bangladesh. Well, we learn much about the BBA degree of a private university in Bangladesh. Now, let’s know about the universities in the private sector who are well reputed for the degree in Bangladesh. This is the first private university in Bangladesh, which was established in 1992. It was founded by the Foundation for Promotion of Education and Research (FPER) that’s a charitable, non-profit, non-commercial and non-political organization, which was renamed as the NSU Foundation. This is not only comprised of a group of eminent industrialists but prominent patrons of education, notable philanthropists, widely experienced academics and senior civil servants of the country. And the Chancellor of NSU is the Honorable President of the People’s Republic of Bangladesh. As BRAC University is to foster the national development process through the creation of a center of excellence in higher education that is responsive to society’s needs, it’s able to develop creative leaders. Also, learning and the creation of knowledge is their activate contribution. In order to equip them with the knowledge and skills necessary for leading the country in its quest for development, the university is to provide an excellent broad-based education with a focus on professional development for students. This is one of the best universities among private university in Bangladesh. It was the first mooted by a group of prominent academics, business leaders, professionals and education enthusiasts led by Dr. Mohammed Farashuddin to provide quality education at an affordable cost in Bangladesh. So, they formed a non-profit, non-political, charitable organization called Progoti Foundation for Education and Development (PFED) with this end in view and the East West University is its first major project. The University was launched in 1996 after being accorded permission by the Government under the Private University Act (Act 34) of 1992. Independent University, Bangladesh (IUB) was founded in 1993, which is one of the oldest universities among the private university in Bangladesh where academic excellence is a tradition, teaching a passion and lifelong learning a habit. As IUB currently has more than 7,048 undergraduate and graduate students and over 10,455 alumni, the student population is projected to grow at 10% annually. IUB is free to set its own curriculum and methods of procedure and to cooperate with academics at home and abroad as a private university. American International University-Bangladesh (AIUB) has progressed by leaps and bounds both as an institution and the programs it delivers to the students since the commencement of its journey in 1994. In their chosen fields are focused to impart quality education and to train the students to become leaders of tomorrow. When they graduate we expect them to gain recognition and acclaim in the academia, society, and industry it makes a solemn pledge to uphold high standards and inculcate the same in its students. With the generous support and patronage of the United Group, United International University is established. In the South Asian region, the vision of UIU is to become the center of excellence in teaching, learning, and research. The Dhaka Ahsania Mission is the founder of the Ahsanullah University of Science and Technology (AUST), which was established in 1995.
International University of Business Agriculture and Technology (IUBAT) is the first non-government university established in Bangladesh and the initial planning began in 1989 and the university was established in 1991. Through their well-defined contributions to education, it geared to effectively contribute to agro‑economic, technological and social development of Bangladesh. As one of the top graded universities in Bangladesh, Daffodil International University (DIU) is recognized in independent government assessments. It has been set for the university to be among the very best in Bangladesh which is the most challenging goal. On 24th January 2002, Daffodil International University came into its educational operation. Modeled on North American Universities, Bangladesh University of Business and Technology (BUBT) was established under the Private University Act in the year 2003. It’s one of the leading universities in the private sector of Bangladesh and it has been providing quality education and training since its very inception.